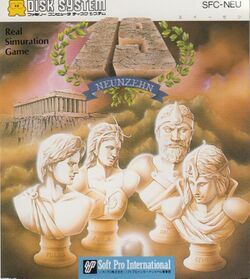 19 - Neunzehn is a stratgy game developed and published by Soft Pro for the Famicom Disk System in 1988. The title contains the number 19, as well as the word "Neunzehn" which is German for 19. Neunzehn is officially represented in the Japanese title as ヌイーゼン, although this is more accurately pronounced "neizen." It was only released in Japan, and has never been translated from Japanese. There is no sequel to this game, but the combat system developed for it was also used, and slightly improved upon, in Soft Pro's FDS title, Fairy Tale. 19 is somewhat unique among turn based strategy games, in that turns are taken in real time, following rules that are reminiscent of the Japanese chess-like game known as Shogi. The game takes place on an overworld map, on which players take turns moving troops. When opposing troops vi for the same location, the game switches to a zoomed-in combat screen, showing each individual member of the opposing forces. While the story of the game revolves around finding a stone, there is no actual stone to discover. Your only goal is to wipe out the armies of the other three opponents. The heir to the throne is shared by four brave people: Darius, Simon, Thales, and Sonia. The 19 gods of Olympus left behind an omnipotent stone to the great emperor Achilles, who has ordered a search to be conducted for the stone. You take the role of one of these four in an effort to find the stone on the island before the rest, waging war with opponent armies to prevent them from finding it first. The combat mode is the most important feature of this work, which accounts for large amount of the effort necessary to complete the game successfully. This mode is played on a hexagonal map, and each combat unit can be given one of four instructions: Move, grapple, move and shoot, or rest. Each of the four generals (one of whom is controlled by the player, and the rest by computer), have distinct traits and characteristics. Units belonging to each general have different options and ranges for actions and combat effects, giving each army an advantage on specific terrain and circumstances. This page was last edited on 24 February 2018, at 01:56.